You may not wear a badge or respond to emergency calls as a paramedic but let's face it, in a way, you are a first responder. There are countless scenarios where you may be the first one on the scene where a person sustains a traumatic, life-threatening injury. You may need to act inside your home or while going about your daily life. You may need to help yourself, someone you know or a complete stranger. The fact that you choose to carry a firearm, indicates that you take your personal survival, and the survival of loved ones seriously. For that reason, I cannot stress enough the importance of carrying a tourniquet or at least having one readily accessible. It literally may be the least expensive piece of gear you own. And one that could be the difference between life and death. Those who spent time in the military, law enforcement or EMT fields are likely aware of the immense benefits a tourniquet offers. If you are not familiar with tourniquets, they are not a new or complex medical device. Tourniquets are used to stop the flow of blood to an extremity that has sustained an injury causing bleeding. Tourniquets are proven devices that have saved the lives of countless people. There are many different types of tourniquets available. CTCCC or the Committee on Combat Casualty Care studies the effectiveness and application of gear such as tourniquets in a combat application. Currently, CTCCC only recommends the CAT (Combat Application Tourniquet) and the SOFTT (SOF Tactical Tourniquet). It is important to note the CTCCC does not endorse specific products. The SWAT-T (Stretch Wrap And Tuck-Tourniquet) is not on the CTCCC's recommended list. 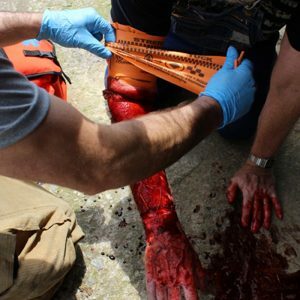 But it still can be an important component of a trauma bag or home medical kit. All tourniquets work on the same principle. You may see actors using belts and torn shirts to make expedient tourniquets. They work, in the movies, and can work if that is all you have. But they certainly are not the best tool for the job. You are probably familiar with the windlass style of tourniquet that uses a handle or lever. Twisting causes the device to constrict around the limb. There are also ratcheting tourniquets that use a device allows that tightens around the limb when pulled. By far the most popular tourniquets are the SOFTT's, CAT's and all the different subtypes and versions of the two. These are what you will see likely see in military personnel and first responder's trauma bags. They are tremendously reliable and effective tourniquets. They are easy to apply, even with one hand. This is what I use a CAT as a primary tourniquet in my range trauma kit. Newer versions addressed one of the weaknesses of the early CAT. The ability to apply it to very small appendages like those of small children or animals. The latest Gen7 CAT's have been shown to be effective on all but extremely small limbs of children. But effectiveness is not the only criteria someone is going to use to decide on a tourniquet. Unfortunately, we have to look at the size of the item we want to carry. CAT's and SOFTT's are a little bulky. So if you're going to carry one on your person, You have to carry in something like a belt or ankle holster. One other ‘drawback' to these devices is they perform only as a tourniquet. These types of tourniquets are relatively expensive at around $25-$35 for a genuine one. In fact, the cost and popularity of these holsters that has caused a host of manufacturers to flood the market with bogus, underperforming, cheap knock-offs. Now the SWAT-T is a tourniquet but different in many ways. The SWAT-T looks like a simple elastic exercise band. It is 4″ wide and 56″ in length (before being stretched). It comes in 3 colors, high visibility orange for most applications this is fine; tactical black, for military or tactical use, and a blue color used for training. I mentioned that other tourniquets can be bulky. 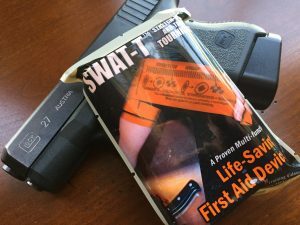 The SWAT-T comes in a package about the size of a deck of playing cards. At that size, it is very easy to throw it into a cargo pocket or find a place for it in your med kit. Like other items, if it's easy to carry, you are far more likely to have it on you every day. 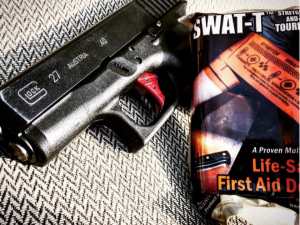 Application of the SWAT-T is quite simple, in fact, as stated above, the name comes from the steps in its application: S-stretch, W-wrap, A-and, T-tuck. Something to be aware of when applying tourniquets, it how tight or loose to make it. The SWAT-T is unique because it has marks printed on it that help you know if you are getting the tightness right. As you can see in the photo, the marks on the SWAT-T will change shape when stretched allowing you to see if you are applying it too tight or too loosely. Applying the correct pressure with the tourniquet can often times be the difference between its application being successful or not. The length of the tourniquet and the way it is applied, allow it to be used on adults, children, skinny appendages or thick appendages. This really is another one of the great things about the device. In addition to being a versatile tourniquet, it can also be used as a pressure dressing, sling, wrap or with a splint etc. There are some drawbacks to the SWAT-T. How will it perform if it is covered with blood, which we all know is extremely slick? Test after test has shown that the SWAT-T retained its ability to wrap around itself and keep from slipping, even when covered with blood. However, because it does use a wrapping method, it is more susceptible to slide around when trying to get that first few wraps around the injured appendage. Like other tourniquets, the SWAT-T can be applied to oneself, which is an important consideration. However, when compared to the other types of tourniquets, is is a bit more difficult to apply with one hand. My experience with the tourniquet was great. Thank God I did not have to use it in an actual trauma incident, but I did take the time to apply it to myself and test the difficulty of application. I wanted to test applying it to myself first, (my wife doesn't like to be my test subject, go figure). I was able to easily learn how to apply the SWAT-T to myself just by using some common sense and trial and error. Application to my legs was pretty simple. Applying it to my right arm, was a bit tricky because I am right handed and using my left hand was more difficult. But it is possible to apply it and get the correct pressure. One other thing to note is that because it has to be wrapped around the appendage several times, you will likely have to move the injured limb around a bit more than with other tourniquets. It is not a huge issue, but something I noticed as I used it in different applications. I mentioned that tourniquets are relatively expensive. And if you're buying a device that could save your life, the price may not be an issue. But it could pile up if you need to purchase multiple devices to stage in vehicles, areas of the home or at work. The SWAT-T you can get for right around $12. That means you can buy nearly 3 SWAT-T's for every CAT. You can never be too prepared, and having more tourniquets would give you a better chance to have access to one no matter where you are. For organizations that may want to equip their employees with tourniquets, it is a much more affordable option. Is the SWAT-T the best tourniquet available? Probably not for every situation. But it does work. There are medical research studies, field reports, and testimonials backing up the claims that the device works. Here is a link to those studies and medical reviews. It may not be the perfect option for every situation but it does provide is some flexibility because of the many ways you can apply it. If a pressure dressing is needed and all you have is a tourniquet and a SWAT-T, the latter may be the better solution. The cheaper cost and slim package allow these to be accessible in multiple locations. After all, in order for any device to be effective, it has to be accessible. 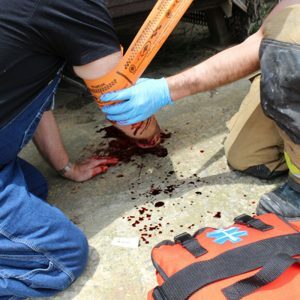 While the SWAT-T may be a little more difficult to apply, it certainly can be effective in stopping blood flow long enough for paramedics to arrive. My opinion is that it won't hurt you to have a SWAT-T in your kit or staged in your vehicle. If you have the ability to carry a SOFTT or CAT, on your person go for it, it is a highly prudent decision. If you can't carry one of those, you could certainly do a lot worse than tossing one of these in your purse or pocket. You don't have to be a trauma surgeon to use or realize the benefits of tourniquets and the SWAT-T.